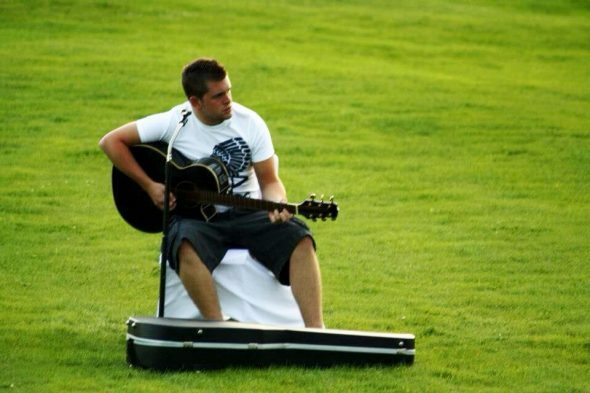 Spotlight on Marvest: Bryan Snider - Spotlight Ottawa	:: Spotlight Ottawa - Your local music scene. Get out and experience it! Spotlight on Marvest will introduce you to the talented music makers in Ottawa performing FREE! shows as part of the Marvest offshoot of CityFolk. What was your reaction to the news you’d be a part of Marvest and who was the first person you told? I was excited! Haven’t played any gigs in a while since the arrival of our twin babies but I’m pumped to get out there again. The first person I told was my fiancé Kaila. I love country music, classic rock, and meaningful songs. I try to mix my favorites together with my sound. How did you get started on your musical journey? When I was a kid, I began guitar lessons. Realizing how cool it was to be able to play the songs I loved had me hooked. What can music fans expect from your show? Will you be playing or releasing any new music? Laid back, easy going, variety of songs that everyone should recognize and a few originals that might catch their ears. I have my first EP that I will be bringing with me that features all original music in the country genre. I’m always writing new stuff, and can’t wait to record again. What artists are you hoping to catch during this year’s Cityfolk and Marvest? I would love to see Jack Johnson, Corb Lund + Ian Tyson, Amanda Marshall and of course, my childhood idol Fred Penner.